Pope Francis’ encyclical on the environment, titled Laudato Si: Our Care for our Common Home, is sparking a rare opening for change. 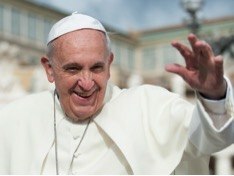 The messages within the 184-page papal encyclical, including the moral imperative to take global action on climate change, are gaining momentum leading up to Pope Francis’ upcoming visit to Washington D.C. Sept. 22, where he will meet with President Barack Obama and address a joint session of Congress. In the end, it is a call to action. This is a rare moment in which we have the opportunity to raise awareness and inspire action. For Catholics and non-Catholics, the encyclical has the potential to transform the global discussion on climate change by framing the planetary crisis in moral and religious terms at a strategic moment in international climate negotiations. The hope is that Pope Francis’ messages will influence policymakers at the upcoming United Nations climate talks in Paris later this year, as well as be highlighted in his upcoming addresses to the U.N. and the U.S. Congress. According to a recent Pew Research Center study, less than half of all U.S. Catholics (47 percent) believe that global warming is a consequence of human activity. Take note: Pope Francis is saying that climate change is real and that humans are causing it. In addition, he connects stewardship of the natural world with justice for the poorest and most vulnerable. Integral ecology, an ecology that links the human and social condition to the environment, is a key theme in the encyclical. “Nature cannot be regarded as something separate from ourselves or as a mere setting in which we live. We are part of nature,” the Pope wrote in the encyclical. USF President Paul Fitzgerald artfully expresses the concept of integral ecology in The Beloved in Nature, a video co-produced by Green Impact, in partnership with Northcutt Productions. “The papal encyclical is igniting energy all over the world, as almost never before in our lifetime,” Tucker suggested. We are on the leading edge of a new movement that weaves science and spirit to find solutions for our social, political and environmental challenges. “This is about long-term change, and a moral force that is unstoppable. It’s a Gandhian force of change,” Tucker said. McKibben commented: “On a sprawling, multicultural, fractious planet, no person can be heard by everyone. But Pope Francis comes closer than anyone else. He heads the world’s largest religious denomination and so has 1.2 billion people in his flock …” Building on the Pope’s reach, other religious leaders have become energized by the encyclical, including more than 400 Jewish rabbis and 20 Muslim scholars, who have responded to this moment of change. Attend the Oct. 1 Integral Ecology series forum reflecting on Pope Francis’ United States visit. Read the encyclical in its entirety. Check out these websites to learn more: California Interfaith Power and Light and Catholic Climate Covenant. Watch Dr. Tucker’s Sept. 3 presentation. Go on a hike and sit quietly in nature. Deborah Fleischer is President and Founder of Green Impact. She recently helped the University of San Francisco launch its new Office of Sustainability, including the production of a series of videos (including the one in this article). Deborah Fleischer is founder and president of Green Impact, a strategic sustainability consulting practice that helps companies walk the green talk. She helps companies design and launch new green strategies and programs, as well as communicate about successes. She is a GRI-certified sustainability reporter and LEED AP with a Master in Environmental Studies from Yale University and over 20-years of direct experience working on sustainability-related challenges in both the public and private sectors. She brings deep expertise in sustainability strategy, stakeholder engagement, program development and written communications. Deborah has helped to design and implement numerous successful cross-sector partnerships and new green initiatives, including the California Environmental Dialogue, Curb Your Carbon and the Institute at the Golden Gate. She has helped create lasting alliances among such organizations as Sierra Club, Natural Resources Defense Council (NRDC) and the Golden Gate National Parks Conservancy with companies such as Disney, Arco, Bank of America and Passport Resorts. You can follow her occasional tweet @GreenImpact or contact her directly at Deborah@greenimpact.com.